At the point last year where Vetements enjoyed an insane amount of success off the back of a reworked DHL-emblazoned jersey T-shirt, we should have guessed that from here on out, no unexpected mass-market logo would be out of bounds. Since then, the mastermind behind this booming brand—the same man leading the experimental new charge at Balenciaga—has blazed forth with the concept and flipped many a recognisable motif on its head. Demna Gvasalia has created his own "fake" branded merchandise that A) highlighted the industry's fast turnaround of such blatant copycats and B) proved that the demand for Vetements wares knows no limits. And real or fake, people want to buy it. Thus, the commentary on consumption rumbles on. There has also been a series of supposedly unfashionable labels he's injected with new life by directly collaborating on products: Take Instagram's current Champion fest, for example. Who expected that the retro sportswear label would ever be so popular again? The logo offering at the most recent Balenciaga show in Paris (autumn/winter 2017 men's) was a riff on the typeface and design of the branding used for U.S. Democratic presidential candidate Bernie Sanders last year. For both mobilizers of the youth, it was subversive, entertaining, and a continuous fashion talking point. But what could be even more significant than this cultural mashup? Well, when we spotted that Demna himself was wearing an instantly recognisable IKEA-stamped blue-and-yellow tee backstage, the next big (and obscure) thing presented itself. 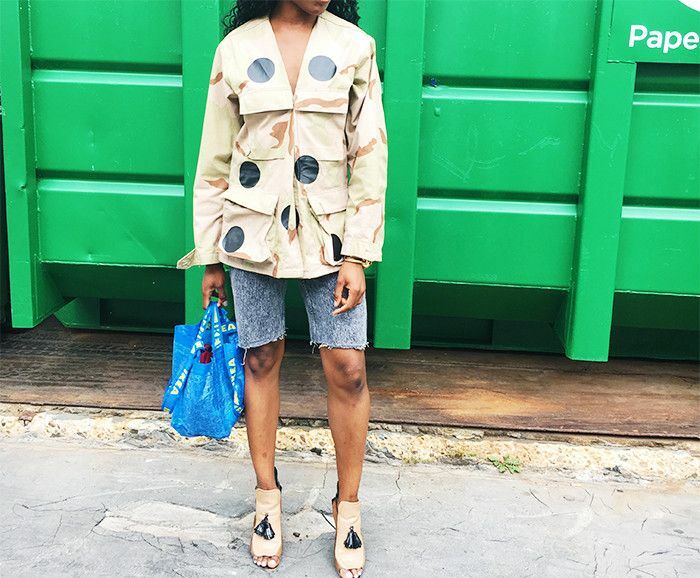 This also prompted us to think back to a few days ago, when one of ASOS's coolest Style Insiders, Debbie Shasanya, showed us how to wear menswear pieces. It wasn't obvious to begin with, but we suddenly remembered she had ditched any sign of a regular handbag for a mini plastic holdall from the aforementioned Swedish megalith. You know the ones with the yellow woven handles that you usually shove ironing boards and meatballs into? Yep. That. Could. Be. Happening. And you heard it here first. Would you? Could you? If not, maybe just stick to the Gucci logo tee all of the hippest girls are buying right now.